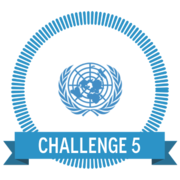 Your fifth challenge is to create a photo montage using the Slideshow or Gallery function in Weebly around your UN Goal (see the example right). Create a new page in your website titled 'Gallery'. Place your montage here.